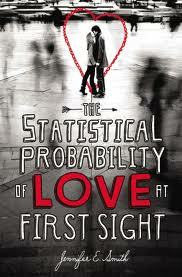 How could I not love The Statistical Probability of Love at First Sight? This new young adult novel has a delightfully whimsical premise: a seventeen-year-old American girl is seated next to a cute English guy on an overnight flight to London. Their chance connection reminded me of how I met my British husband at an American university. My phone wasn’t working so I knocked on a random door to test it in a neighbor’s outlet. Henry had a cute accent and gorgeous green eyes, but best of all, he made me laugh. “Get rid of the phone and have a beer,” were his first words to me. Henry and his friends were flipping pancake in celebration of Shrove Tuesday. I was charmed. After falling in love at first sight, Henry proposed three weeks later and again and again. He tried to trick me with double negatives: “Is it not true that you would not consent to marry me?” He proposed over champagne, with flowers and under rainbows. Two decades later, we returned to England with our children for a sabbatical at Oxford University. Statistical felt like our personal story with a darker edge. Hadley is traveling to London with heavy baggage: her father had an affair during his sabbatical at Oxford University. She will be meeting her future stepmother for the first time at their wedding. Hadley is also afraid of enclosed places, especially airplanes, but luckily she has the best distraction. Oliver just finished his freshman year at Yale and appears to be majoring in flirting. Their story unfolds with a surprising twist that forces Hadley to look beyond her own problems. I’d strongly recommend Statistical to readers ages 12 and up, including adults. It would make the best airplane book, and I mean that in a good way. As I read Statistical, I couldn’t tell if the author, Jennifer E. Smith, was American or British; she was that good at capturing the linguistic differences and cultural nuances. Oliver sounded a lot like my husband, especially his sense of humor. I passed the book to Henry, who devoured it in one day. He guessed that the author was American since the dad sports a tux among the morning suits at an English wedding, but Henry was otherwise very impressed. She even got the flavor (or should I say flavour?) of North London. Intrigued, I tracked down the author in London, where she was working for a month. Why did you pursue your master’s in creative writing at St. Andrews in Scotland rather than at an American university? In some ways, I guess it was more about the place than the course – I’d been living in New York City, and I knew I wanted to go back there when I was finished, so it seemed like an ideal opportunity for a change of scenery. I also knew I wanted to return to publishing after finishing the course, and since UK programs are only one year instead of two, it seemed like a good choice. And it was. I can’t say enough good things about St. Andrews – I absolutely loved my time there! What were some of the challenges of being an American studying abroad? What inspired you to write Statistical? A few years ago, I was on a flight from Chicago to Dublin, and I got to chatting with an older man who was seated beside me. 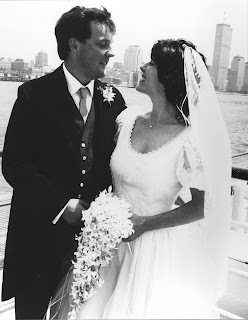 It wasn’t romantic at all – just friendly – but he was from Ireland, so when we got off the plane and arrived at the line for customs, we had to part ways before we had a chance to really say goodbye. On the other side, I waited for a few minutes to see if I could find him, but I never did, and it struck me as interesting that you could sit beside someone and talk for hours without even knowing their name, and more often than not, without ever seeing them again. It seemed an interesting way to explore the idea of fate in a story like Statistical Probability. Why did you restrict the story to 24 hours? I’ve always really liked stories that are bookended by some sort of set timeframe. At first, I thought the book would take place over the course of a weekend, because I wasn’t sure I could fit everything into the span of just 24 hours. But by the time Hadley and Oliver stepped off the plane, their story was already pretty far along, and I realized that with the right combination of minutes, 24 hours can actually be quite a long time. What type of editing do you do in NYC and London, and how does your day job affect your writing? I’m actually only in London for a month, working out of our UK office, but I’m usually based in New York. I’m mainly a fiction editor, though not for YA or children’s books. And while it’s always a bit of a struggle to balance writing and editing, I’ve learned so much from doing both, and I feel very lucky to have two jobs that I love. That you have to write without fear. It’s not easy to silence your inner critic, but it’s useful practice for later on, when you need to learn to silence all those outer critics too! Because if you’re writing for yourself, then none of the rest of it matters…. I actually have my first middle grade novel coming out in April, which is called The Storm Makers. And then I’m just finishing up my new YA book, another contemporary love story called This Is What Happy Looks Like, which will be out sometime in 2013. What is the subject and setting of This is What Happy Looks Like? A misdirected email sparks an unlikely romance between two 17-year-olds on opposite sides of the country. Thanks, Jen! I'm looking forward to your next YA. My teenaged daughter is reading Statistical right now. Do you know if Statistical is out on kindle?? Great interview Sarah, it sounds like a brilliant book. This review and interview was the best way to start my day! (It's still early morning for me.) Sarah, I loved learning a little of your personal history. Thanks for the review. I have added this book to my TBR list! This novel is right up my street. I fell for my wife on the same night we met at Havana's Grand Theatre. I loved the review and the interview. You do dig out some real literary gems. This sounds like a delightful book and I enjoyed your personal story of meeting Henry. He sounds like a real charmer. Being an Anglophile, I'm always swayed by the accent. Thanks for another great recommendation. Shaista, Statistical is available on Kindle. Good luck with your screenplay! Barrie, thanks for hosting the book review club! I’d love to hear your reaction. ACIL, what a romantic place to meet your wife and very fitting giving your shared interests in performance arts! Cid, Statistical defines Anglophile. You'll love it. I met my Australian husband on a flight in a six seater Cessna. He was the "Outback Mailman" on a long 13-stop day over Central Australia delivering mail to Aboriginal communities and cattle stations. I signed up for this trip (and my fate as well!) with my 16 year old son back home in California. I married the pilot four months later. Accents and planes are very seductive! Now I read you blog in Queensland. Sounds like a great book. I will follow her advice to write without fear. I need to quiet that inner critic more. Thanks! This sounds lovely and right up my alley! The upcoming YA too! And this review made me yearn to go back to the UK!! My time there was way too short. I can see why you enjoyed this book, Sarah--it does sound somewhat like your biography! I like Jennifer's advice about silencing the outer critics--good advice for more than just writing! I always enjoy reading your interviews. I just added this book to my list of books to read. It sounds like a good one! I like your wedding picture and your account of how you and your husband met. How sweet! Your wedding photo is really lovely! I believe in destiny, so I believe in love at first sight, though I know there are readers that do NOT like "love at first sight" story. I'm very interested in what makes the story successful and dramatic! How cool is all of this post? I loved reading your story, Jennifer's story and the book's. Chance encounters of the fascinating kind. What a lovely picture of you and Henry! Of course you loved Jennifer's book! I love the inspiration for writing the book. I've had many such encounters like that on a plane or waiting at an airport. Sounds like an interesting book and I wonder how I could lay my hands on it :-) You've written that your husband guessed that the author was American since the dad sports a tux among the morning suits at an English wedding, could you explain that to me? All, thanks so much for your comments! If you read this book, come back and let me know what you think of it. Stephanie, the story of how you met your Australian husband is even better than fiction. Thanks for sharing! Petra, a morning coat is a formal suit with tapered tails, matching trousers and a contrasting waistcoat that is worn for formal daytime occasions, such as weddings, in the UK. My husband is wearing his in our wedding photo. Americans in a formal wedding party would wear a tuxedo (or “tux”) daytime or night. The Brits call a tux a “dinner jacket” and only wear it in the evening, but not to weddings. My husband felt that a British bride would have insisted that her American groom wear a morning coat for such a carefully planned wedding. I assumed the American groom owned a tux and hadn’t realized that the others would all be in morning suits. Foreign rights to Statistical sold in something like 9 countries, but I don’t think Czechoslovakia was one of them. You could order it through Amazon. Sarah, thanks for the explanation, I see the point now. Petra, I've also heard good things about the book depository which offers free shipments world wide. You can pay in euros. Thanks for the tip, Sarah, I'll take a look at that. I'm quite fond of those interstitial places like airports and being in between jobs, at least for the time they allow for thinking. The book sounds great for interstitial reading. There's no mistaking the look of love between you and Henry. What a delightful picture! Thanks for sharing your insight into this romantic book, Sarah. 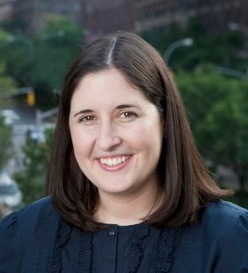 Sarah, fascinating interview made more so by the fact that one of my sons graduated from St. Andrews. Love the title THIS IS WHAT HAPPY LOOKS LIKE. And I want to come to Maine this summer! Thanks for all the detailed ideas. Off to check out the NYT series on craft--in my too-full life at the moment, I missed that. I loved being reminded of yours and Henry's romance--especially the beautiful photo! Sounds like a fun book I will have to check out. I can't wait to read this one, and it sounds like my teenage daughters will appreciate it as well. I also enjoyed the author interview -- and the way you wove a bit of your own "love at first sight" into the narrative. Loraine, I'm glad to hear you liked it too. Great news about it becoming a movie! Not all books transfer well to the screen but this one would very well.